The good people at King Arthur Flour contacted me about offering a special offer to readers of The Challah Blog... FREE SHIPPING TODAY ONLY! 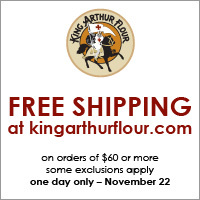 King Arthur Flour normally reserve our best promotions for the folks signed up to receive our emails (which are AWESOME, and I totally recommend you sign up to receive them! ), but this year they're letting you in on it! For one day only – Thanksgiving Day (until midnight) – you will receive FREE shipping on your $60 order. Please click on the picture below to access the sale! Happy Thanksgiving from our bayit to yours!!! Oh, and don't forget their Baking Hotline, where KAF's experts are available daily to help with holiday baking crises! Note: I was not compensated, and I did not receive any products from King Arthur Flour for hosting this sale on my blog... though I WILL be taking advantage of it myself!